Today was a really nice day of racing. The wind was up with a constant 10 gusting to 20 out of the south and the temperatures were around 45 degrees. Sadly the sun did not come out which would have made it nicer. Thanks to John and Jolie for doing RC. They were able to get off 6 Olympic races and had a pretty square course. Each race was running about 18 minutes. Due to all the recent rain, we had a nice high river and the current was ripping out all day with it getting worse at the end of the day. As for the sailing today, first off, the starts were pretty important. We had several people over early which was probably due to the current. 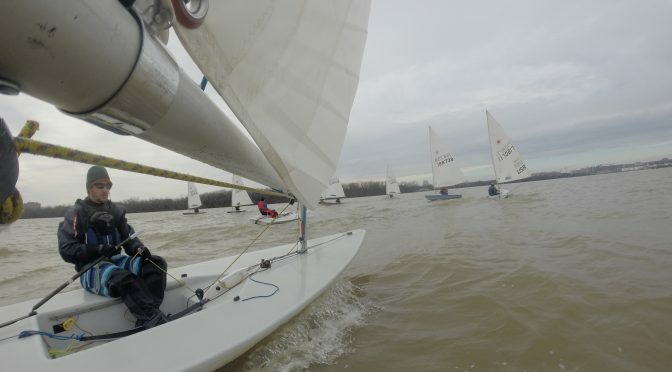 With the current trying to push you over early and the boat side favored, I was starting on the pin end and beginning low and coming up to the line with speed. This seemed to work for me pretty well. Another thing that was a bit wild with the current was that at the windward mark the lay lines were not true. I noticed a lot of people over standing the lay lines with the current. On the sail to the jibe mark, a lot of people were sailing quite high which added some distance to the sail. Several times I saw Nich staying low and gaining on a bunch of boats. For finishes, I found that the pin end was much better to pick. All of these 3 comments are to try and sail the shortest course which should be the goal! A final comment is that with all the breeze today, it was important to have your vang on upwind so that you could get the sail in for block to block sheeting as well as let it out to dump power without losing height on your pointing.